Speaking at an international NGO gathering in September 1968, the Jamaican Ambassador Egerton Richardson noted that the international community had now reached “our moment of truth, when we came face to face with the nature of our beast – when we saw what it means to be promoting the cause of Human Rights by working mainly through governments.” Richardson highlighted three crises: Czechoslovakia, the Middle East and Biafra. Biafra was a recent entry on the map of conflicts that occupied international attention. In June 1968, pictures of starving and dying Biafran children started to appear in Western newspapers and magazines. These images shook Western audiences generating widespread appeals for action from Western states to address the suffering. Biafra was a Nigerian crisis, a postcolonial crisis, a 1968 crisis and a crisis for human rights and humanitarianism. 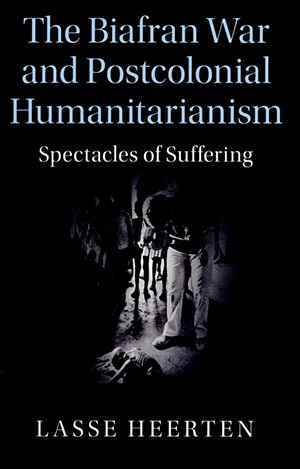 All these themes are captured in Lasse Heerten’s rich and meticulously researched book The Biafran War and Postcolonial Humanitarianism: Spectacles of Suffering. It was an intense but short-lived campaign as popular mobilization for Biafra began to fizzle out during 1969. Heerten argues that the war is now “widely forgotten” outside Nigeria and that the conflict does not play an important role in popular or academic narratives about the 1960s and 1970s (p. 10). This claim may not be fully accurate; one reason being that the conflict directly inspired the founding of Médecins sans Frontières, one of the most respected humanitarian organizations today. However, the Biafran crisis indisputably deserves greater attention for international scholarship because the conflict remains an illuminating prism through which to understand the enduring legacies of the postcolonial condition. The language itself is significant. Are we talking about the “Nigerian Civil War” or the “Biafran crisis”? Was the conflict a threat to the integrity of an existing, unified state or was it the birth of a new nation that carried justified claims for self-determination? These labels defined the nature of the conflict and the perception of it elsewhere, including the historical comparisons made in these other contexts. Was the conflict comparable to the American Civil War or was Biafra comparable to the creation of the new state of Israel two decades earlier? Biafra quickly became embedded in a variety of contested meanings. This includes the visual aspect of the story which is analyzed through a series of images of photos and news stories from 1968 that illustrate how the story was presented to a Western public – the spectacle of suffering as reflected in the book’s subtitle. Heerten succeeds in bringing out the highly varied transnational reception of the Biafra crisis in Germany, France, the United States and the United Kingdom. This includes analysis such as the dynamics in Germany between Holocaust memory and Biafra. The Holocaust was not yet a fully formed concept in 1968 but even still this historical experience helped make Biafra visible as a “genocide”. In return, Biafra made the mass murder of European Jews more distinct from the larger complex of Nazi evil. Heerten therefore sees Biafra as a “neglected episode in the history of the emergence of Holocaust memory” (p. 19). The year 1968 is also an important feature of this story in other ways. During 1968, Biafra served as something of an antidote to the Vietnam protests and accusations about Western imperialism. The New Left had a hard time finding a position on Biafra and it was instead center-leftists and conservatives that made a political cause out of Biafra and from where calls for international intervention emerged. This makes it a rather different story to the one traditionally connected to the scholarship on “1968”. The book, however, is about more than Biafra. It also speaks to larger historiographical fields. The writing is particularly strong when extracting lessons about the emergence of post-colonial realities. It furthermore aims to contribute to the histories of humanitarianism and human rights by viewing them as more intertwined than what is commonly portrayed. Heerten shows that the bridge spanning decolonization and the post-colonial moment could indeed be a narrow one and this sealed Biafra’s destiny. The conflict erupted while the right to self-determination was high on the international political agenda and was still being pursued across Africa. But Nigeria had become independent seven years before in 1960 and Nigeria’s sovereignty became “a structural advantage” that commanded international respect. While Biafra tried to escape the massive violence of postcolonial politics – reflected in large-scale ethnic cleansing of Igbos in 1966 – their claim for statehood emerged after postcolonial sovereignty had started to trump self-determination. As Heerten writes, “the creation of new nation-states, which had become the focal point of the mindset of decolonization, still defined the political imagination of many contemporaries. However, for postcolonial secessionist movements like Biafra, it was beyond the realm of the possible” (p. 79). There were different temporalities at play on the African continent during the 1960s – between colonialism and the postcolonial – and what had catapulted the independence claims forward also partly explains Biafra’s downfall. The consequences of this were massive and extended far beyond the lost lives and hopes at this point in time. Heerten argues that the Nigerian Civil War produced “a loss of confidence in postcolonial governments per se.” (p. 311). The political consequences hereof proved far-reaching because they sparked a postcolonial debate about the alluring, yet stark choice between humanitarian intervention and non-intervention in respect of self-determination or sovereignty that has endured and haunts us still today. Here, Heerten’s work helps illuminate a larger postcolonial human condition in which the humanitarian agencies “enact the part of the explorers of a terra incognita of postcolonial misery” (p. 322). There is no doubt that humanitarianism at this point entered into a new era both as a political imaginary and as a field of operational practice. By his combined focus on Biafra as a case and the postcolonial world as a structural reordering of the international system, Heerten does not overstate the historical significance of his case-study as could have been a risk. Instead the two perspectives inform each other to their mutual benefit. The link presented between humanitarianism and human rights remains more tenuous. Heerten rightfully asks how we can understand the collective transformational effect of humanitarianism and human rights on international politics if we create a sharp distinction between them (p. 7). There are factors such as their legal foundation, their operationalization and their political-institutional infrastructure that separated them as they expanded as fields of practice from the 1970s. However, the chronology and causalities behind their new historical significance from this postcolonial vantage point certainly call for this question to be asked but in the end, the book does not bring them sufficiently together to provide a convincing answer to this complex question. The book’s strengths emerge more strongly on the humanitarian theme than on the human rights dimension. Heerten does point to some important overlapping features but it will be up to future historians to figure out how closely the comparisons here can actually be made. Steven L. B. Jensen: Rezension zu: Heerten, Lasse: The Biafran War and Postcolonial Humanitarianism. Spectacles of Suffering. Cambridge 2017 , in: H-Soz-Kult, 31.05.2018, <www.hsozkult.de/publicationreview/id/rezbuecher-28422>.